The Bruins got a goal just 69 seconds into the game when David Krejci was left alone early and the goal stood up as the game-winner as Tim Thomas‘ 31-save shutout was enough for the Bruins to get a 2-0 win in Tampa Bay. Andrew Ference got a key third period goal for the insurance goal and Patrice Bergeron was an immediate impact player in his return. The Bruins got on the board early, just two shifts into the game when David Krejci was left open in front on a busted coverage. The play started out innocently enough with some board play but then Victor Hedman abandoned the front of the net to chase after Milan Lucic in the corner. Lucic found Krejci out front all alone, Krejci then faked and went backhand over a diving Dwayne Roloson. 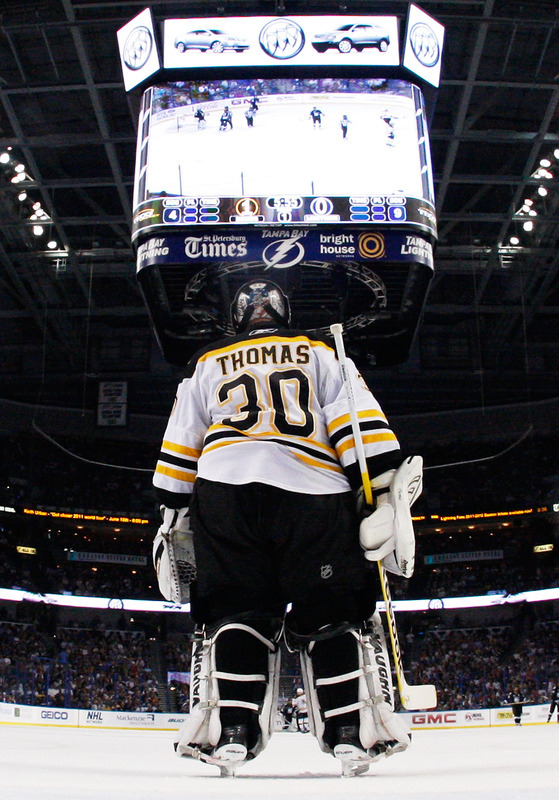 Tim Thomas faced a lot of pressure early and was sharp after the Bruins took a few shifts off mentally, making several key saves on a big shift from the Bolts’ first line. The Lightning continued to press the Bruins but the defense hang on with a bend-not-break mentality. Towards the end of the period Marc-Andre Bergeron laid out David Krejci with a high hit that saw the center take a knee on the ice for a while. Bergeron was given two minutes for elbowing although his shoulder was tucked in but it was a headshot. The Bruins should have gotten a two-man advantage when it appeared that Roloson played the puck outside of the trapezoid but it wasn’t called. The Bruins power-play went by the wayside and the Bruins went to the room with a 1-0 lead. The Bruins would get another Grade A in the first minute but Roloson came up big in a desperate time for the Bolts. From here the game settled down a bit from the helter skelter first period. The Lightning would get their first power-play six minutes in when Brad Marchand was called for high-sticking after the whistle as he was falling to the ice. Just after a Steven Stamkos shot was just deflected just high the Bruins broke out a 2-on-1 the other way where Chris Kelly kept it and missed high. The Bruins would get a power-play at the mid way point when the Bolts were called for too many men. The Bruins power-play would be terrible, feeling the pressure a lot and eventually taking a penalty when Bergeron was called for interference after a turnover at the blue line. The Bruins killed off the penalty which was a stressful one and got a rush just as the power-play expired. Bergeron was led out by a long outlook pass and then pulled up on the blocker side before feeding a streaking Rich Peverley on the doorstep but Roloson got the pad on it to stuff the Grade A bid. The Bruins would get the next power-play, this one with three minutes left in the second period, giving them a chance to get a critical second goal. After it took a while for the Bruins to settle down they had a good finish and nearly scored after the penalty expired. The pressure forced Guy Boucher to take a timeout after an icing. The Bruins were happy to play a good road period, playing within themselves and slowing down the Bolts rush and counterpunching when need be. The Bruins would eventually eek out a goal when Andrew Ference ripped a low shot through a few layers that just barely squeaked behind the goal line. Ference’s shot barely left the ice but Roloson couldn’t see it as Kelly was giving a screen out front. The Bruins would give up a power-play to the Lightning shortly after when Zdeno Chara was sent off with 10 minutes left. The Bruins rallied without their captain and killed it off fairly strongly. The Bruins then were happy to chip and chase and even ice the puck. The Bolts had to pull their goalie with just over two minutes left. The Bruins killed off the final two minutes without much resistance from the Lightning and took the game 2-0.